As the brains of most every modern computing gadget, the central processing unit or CPU is an indispensable part of every desktop, laptop, phone, or tablet. The processor crunches the numbers and assigns the tasks, and it's one of the chief pieces of hardware that determine how thick your laptop is or how long your phone’s battery will last. Every year, these slabs of silicon get smaller, stronger, and more energy-efficient. That’s good news for gadget mavens, as devices become faster, lighter, and generally more impressive as a result. Next year will be no exception. In this article, I’ll look at what’s expected from Intel, AMD, and Nvidia. It’s a bit too soon to tell how things will shake out--expect big announcements from the CES tech trade show in January--but I’ll try to fill in some of the blanks. In the desktop and laptop markets, there are two major players: Intel and AMD. Of the two, Intel has gained more traction this year, bringing a number of powerful, popular components to market--with the promise of much more to come in the next year. Intel operates on what it calls a “tick-tock” cycle. With every "tick," Intel introduces a new manufacturing process. In 2010, Intel’s “Clarkdale” desktop processors reduced the company’s Nehalem microarchitecture to 32 nanometers, delivering improved performance and energy savings. With every "tock," Intel introduces a new microarchitecture. In 2011, we got Sandy Bridge CPUs, which deliver superior performance to their Clarkdale predecessors while cutting power costs and improving the integrated graphics performance. We’ll see the next “tick” in 2012, when Intel shrinks the Sandy Bridge microarchitecture down to the 22-nanometer process. The resulting new CPUs, code-named Ivy Bridge, promise even better power savings and performance, much as the last two processor generations did. 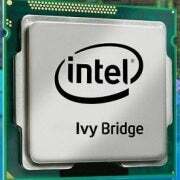 Most of the information we have about Ivy Bridge comes from the Intel Developer’s Forum held earlier this year, plus the occasional leaked PowerPoint presentation. Of primary importance is Intel’s die shrink, which moves from the 32-nanometer process to the 22-nanometer process. Switching to a smaller die size allows processor manufacturers to create chips that draw less energy. Earlier this year Intel unveiled the 3D “tri-gate” transistor technology that it has implemented to make the transition to the 22-nanometer process. The new transistors are smaller, faster, and more power-efficient, and will be key to the performance gains that Intel claims we’ll see with Ivy Bridge. But what does all of that mean for you? Simple: An Ivy Bridge CPU will supply performance similar to that of a Sandy Bridge CPU while consuming less power, and it will offer greater performance while consuming the same amount of power. That means you'll see laptops that provide better battery life without sacrificing speed, as well as faster desktops that are easier on your utility budget. Intel has offered no confirmation of what the Ivy Bridge lineup will look like, but leaked reports obtained by Xbit Labs give some information on the new processor line’s naming convention, as well as its CPU frequencies. The new CPUs will purportedly follow the standard naming convention for Intel’s Core processors, falling into the 3000 series (Sandy Bridge was the 2000 series). A refresher: Traditionally Intel divides the Core platform into three segments--Core i3 at the low end, Core i5 for the midrange, and Core i7 at the high end. Following that designation is a model number. You may also see a suffix at the end of the model number: K for unlocked processors, S for “performance-optimized” processors, or T for “power-optimized” processors. The S and T variants are generally for OEM use only--expect to see them in desktops and laptops on retail shelves. 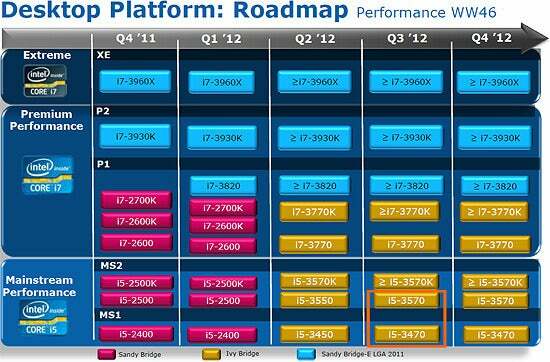 An unlocked, higher-end Ivy Bridge CPU, for example, could be named the Intel Core i7-3770K. We also know that Ivy Bridge will be compatible with the LGA 1155 socket--great news for Sandy Bridge owners, who may not need to buy an entirely new motherboard to upgrade. And if you just dropped a few hundred dollars on Intel’s Sandy Bridge Extreme Edition processor, don’t worry: When I met with Intel representatives, they told me that Ivy Bridge Extreme Edition will use the LGA 2011 socket, so you too have a clear upgrade path. Other notable enhancements include an upgraded graphics core built into the CPU, allowing DirectX 11 support with Intel’s integrated graphics. We don't have many concrete details yet, but with every microarchitecture iteration we’ve seen, Intel’s integrated graphics improve. Ivy Bridge CPUs will also bring native support for USB 3.0 and Thunderbolt, which we hope will mean greater adoption of those connectivity technologies across desktops and laptops of all makes and models. We've heard no word on when Ivy Bridge CPUs and products equipped with them will arrive, but you can expect to see them sometime around the second quarter of 2012. We’ll certainly know more in January, once Intel releases a few more details at CES. Now, what about AMD? The budget-minded processor manufacturer is focused on its Fusion APUs (Accelerated Processing Units), which combine CPUs and GPUs onto a single piece of silicon. AMD has its work cut out for it over the next year, however. In October, AMD pulled the curtain back on its long-awaited Bulldozer architecture. 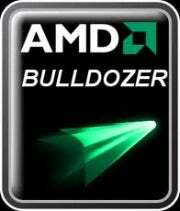 Unfortunately, Bulldozer had a rather disappointing launch, and my own testing showed that the best chip technology that AMD could muster failed to outdo Intel’s midrange offerings. The company will follow up the Bulldozer microarchitecture with Piledriver, an enhanced variant of the Bulldozer core. Actual details are slim, and code names for individual desktop and laptop lines abound, but we do know that AMD will be looking to boost the performance per watt and will be baking in stronger GPU cores. Piledriver is still expected to be a 32-nanometer architecture, which puts AMD at something of a disadvantage in light of Intel’s 22-nanometer Ivy Bridge. We aren’t expecting to see Piledriver until sometime around the middle of 2012. Bulldozer arrived only a few months ago, after all. Once again, expect more news from the AMD camp around the CES time frame (CES starts the week of January 8). I’d be remiss to discuss processors without touching on the mobile market. Tablets and smartphones are the gadgets du jour, and although consumers might be a bit more concerned about aesthetics and apps than about their portable bauble’s innards, quite a bit of power is at play inside. It seems like only yesterday we were wondering what to do with more than two cores in our cellular phones. In 2012, quad-core processors will rule the day, with chip manufacturers such as Nvidia and Qualcomm leading the charge. 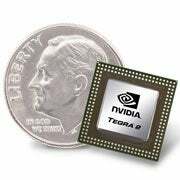 Nvidia’s Tegra 3 is one of the first quad-core mobile CPUs to come to market, and the latest in Nvidia’s Tegra system-on-a-chip line. The system consists of an ARM Cortex A9 CPU with an integrated 12-core GeForce GPU to power the graphics. Expect a deluge of Android tablets to use these chips, as device manufacturers pile on the features in a never-ending arms race. Qualcomm will be introducing quad-core Snapdragon S4 chips in time for the 2012 holiday season. These chips will support tablets running Windows 8. The S4 will be built on the 28-nanometer process, down from the 45-nanometer process that Qualcomm used on the current-generation S3 chips. Expect improved performance and reduced power consumption. For a thorough assessment of what to look for in mobile phones next year, be sure to read "Quad-Core Phones: What to Expect in 2012."